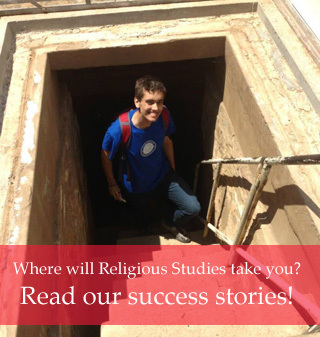 Religious Studies supports graduate student travel by means of two awards, the Mabel Jensen Conference Travel Award and the Research/Academic Development Travel Award. Applications are accepted on a rolling basis. Funding will be determined on the basis of seniority of applicants, funding available, and the projected number of applicants, and is normally capped at $500 per conference. The funds will be disbursed after the event. The department's Mabel Jensen Fund provides funding to support graduate students who: (a) plan to present a research paper at a professional conference, workshop, etc., or (b) plan to attend an annual meeting of the American Academy of Religion or a comparable professional meeting for the specific purpose of consulting with faculty in prospective Ph.D. programs. Students must submit a Graduate Student Travel Award Application, below, to be considered. APPLICATIONS MUST BE SUBMITTED BEFORE YOU TRAVEL. Contingent upon available funds, the Department of Religious Studies is able to support activities directly related to a graduate student’s academic program that are not otherwise funded by scholarships, grants, or other university or departmental funds. Eligible activities could include, for example, intensive language study, field or archival research, or short-term workshop or skill development opportunities. Graduate students should apply for the student research/academic development travel award via the Religious Studies Scholarship Application site. If you are applying for travel money from the Department of Religious Studies, you should also apply for financial support through the KU Office of Graduate Studies. Additional financial support for conference presentations is available to graduate students through the Graduate Scholarly Presentation Travel Fund administered by that office.